I owe my little blog a lot of love. I owe it little write-ups on books by Junot Diaz, David Sedaris and many more (NOTE TO SELF). 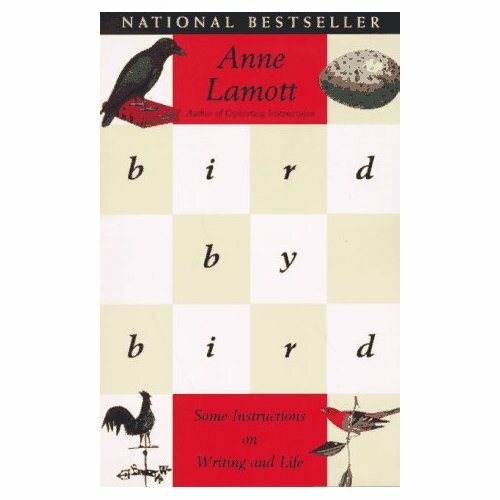 I’m currently snacking on Bird by Bird by Anne Lamott. It is quite the tasty treat. I couldn’t put it down (okay, I snuck in some Time and Newsweek during Shabbos, too) all day. I have yet to laugh quite so uproariously while reading a book on writing instruction but then Lamott’s subheader promises “some instructions on writing and life.” Honestly, it’s a great piece of nonfiction that will put a “pep in your step” and get you working on having a writer’s life, mind and heart. I was shocked to find that there were complaints on Amazon.com for Bird by Bird. Some misguided folks picked it up thinking it was the Holy Grail of writing instruction, some sort of mythic workbook type perhaps. But unfortunately for them, and fortunate for those of us who welcomed the surprise, Bird by Bird is really told in a very colloquial style that is meant, I believe, to resemble one of Lamott’s writing classes. As I read, I imagine myself on the edge of my seat (in a fit of giggles usually) while Lamott disseminates advice with glee. One example of funny, shocking nugget of advice is when Lamott recommends “any number of things [that] may work for you—an altar, for instance, or votive candles, sage smudges, animal sacrifices, especially now that the Supreme Court has legalized them” to help quiet the negative voices in a writer’s head that she names “radio station KFKD.” I’m abbreviating because the station name is a little too salacious for my blog. Anyway, Bird by Bird is exactly what I needed this week after enduring one terribly long week of fibromyalgia flare-ups (chronically fatigued and in pain) where I felt especially negative about my writing skills. Um, writing is hard work. And unfortunately, with the computer within walking distance of my bed, my brain doesn’t seem to shut off even long after my computer has shutdown.